1 U.S. World War 2 Richtig fighting knife. 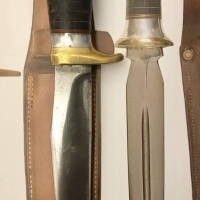 This one of a kind Richtig fighting knife would make an important addition to any U.S. military or world militaria collection. This is an exceptionally large and rare WW2 Richtig fighter. This is a large 18 15/16" Richtig fighter. The blade itself measures 13 3/16". This Richtig fighter is stamped 'F.J.R. CLARKSON NEB.'. The guard and pommel are brass. The pommel has an extended lanyard ring. This WW2 Richtig fighting knife shows both honest signs of carry in World War 2, and exceptional condition. The blade was kept perfectly sharp on a stone. This knife has an edge like only a Richtig can have. The handle is excellent. This ultra rare Richtig WW2 fighting knife would make a one of a kind addition to any collection.